A useful links site for several specifications. A list of turoring lesson aims and objectives will be available for each tutored student. Essentially tutoring is about ‘How to Pass Exams’ Revisiting key topics and finding the best resources. Tutoring can only be solely a teaching activity if the Tutor and Tutee have the Specified learning hours for the Specification. In the case for A Level this would be around 4-5 hours per week over 39 weeks x 2 years. Tuition in reality is usually 1 or 1.5 hours or a even a double session once per week with extra in holidays (free daytimes) and Exam leave. The key to tuition is to find and work with some of the best resources and recap topics. Mostly Tuition is part of the Independent Study or complementary study hours to provide additional explanation, understand the Specification (and how it is important to the level of study and details about subject topics), help with a successful set of linear examination notes preparation, assist planning, develop discussion, consider ‘Assessment Objectives’ awareness and build a Study Plan. Examination Technique and Exemplar awareness are important too. 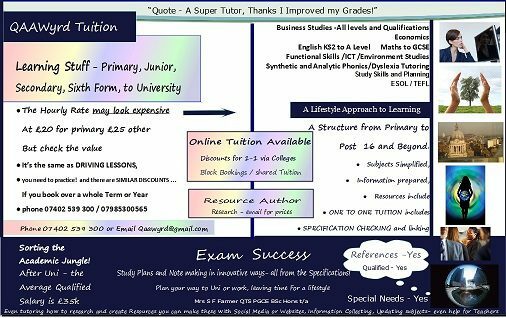 It is so very necessary to have a comprehensive set of notes made from the School or College to add to while the student/tutee progresses through their course. Researching all kinds of subjects to tutor takes time and patience to find the correct balance of Visual, Auditory and Kinasthetic information in this digital age, and most importantly to not have to look at or consider or sift through irrelevant materials (the internet is full of such wrong turns and bad information ie timewasting and irrelevant details). Searching for good information beyond that recommended by the examination board can be stressful, let your tutor take that stress away and let you concentrate on learning. If in doubt stick to the Examination board recommended textbooks and well known revision guides.